← 254 "The Computer Wore Menace Shoes"
The family deep sea dive to the couch. The camera zooms out and we see that the living room is in a fish bowl. "The nurse is not dealing"
The Great Money Caper is the seventh episode of season 12. It originally aired on December 10, 2000. "Strapped for cash, Homer and Bart thumb their way through A Child's Garden of Cons in search of the road to easy money." The episode opens with the Simpson family eating at the Springfield Dinner Theater. Bart buys a magic kit and as the family drives home, a sturgeon falls from the sky (from the Russian space station Mir), damaging the car. 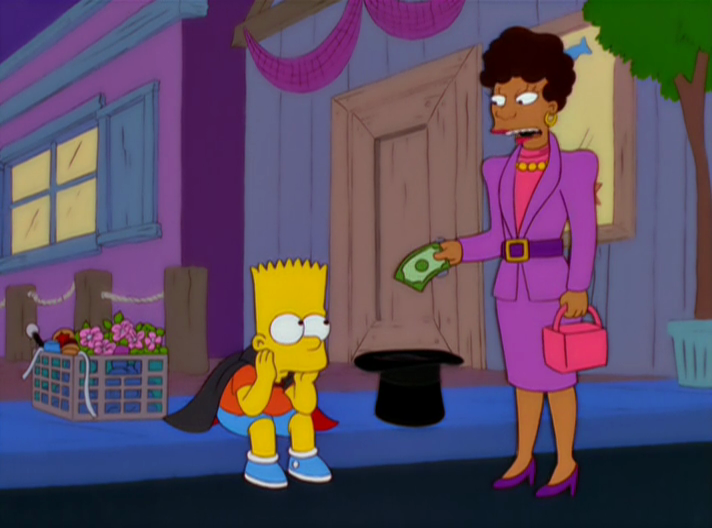 Bart offers to pay for the damages by making money from his magic act, but it doesn't make enough. Homer is angry with Bart and leaves him to walk home. People seeing Bart's dilemma give him money to get home. Homer gets the idea to trick people to give him and Bart money. They take up grifting, and decide to continue doing so after earning enough money to fix the car. When trying to grift the Springfield Retirement Castle, they are caught by a member of the FBI. When they arrive at the police station, the man lets Bart and Homer turn themselves in. The FBI member is revealed to be a grifter, who has stolen Homer's car and the money they took from the old folks. Bart and Homer lie that the car was stolen by a foreign loner with wild, bushy hair; the next day, Groundskeeper Willie is arrested. During the trial, Homer is led by the lawyer to implicate Willie. Once Willie is found guilty and given his sentence, he goes berserk until Homer tells the truth about the theft. It's then revealed that the theft and arrest were all a hoax, in which everyone in the courthouse, TV news, and Devon Bradley (who played the car thief) was involved (except Willie) to teach Bart and Homer a lesson about grifting. Homer, showing a rare moment of intelligence, asks why everyone in town felt the need to teach him and Bart a lesson. Just when Lisa was about to explain why, Otto bursts in and declares "Surfs Up!" and everyone goes surfing. The episode was written by Carolyn Omine and directed by Michael Polcino. Edward Norton guest starred as Devon Bradley. Simpson Crazy labelled this as the worst episode of all-time. Modified on October 2, 2015, at 06:29.